Last year, I made Lake Trout Sausage with trout caught in Keuka Lake. 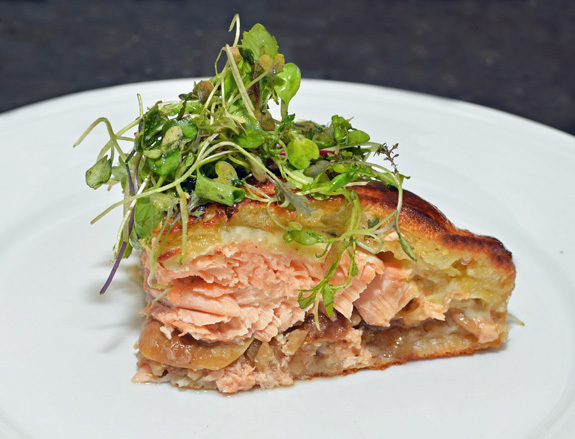 This recipe uses Chinook salmon from the Salmon River, but the difference doesn’t stop there. This is really a sausage that copies the model of your usual meat sausage, and it’s definitely not pescatarian. In order to get the level of greasy goodness I want, I’m using beef fat. As it turns out, beef shares many chemical compounds with salmon, and when you think about it, in American food, salmon’s a little bit like the beef of the sea: fatty, full-flavored, and even cut into steaks. Natural sausage casings can be purchased here, and your butcher’s likely to give you fat from steak trimmings for free. Of course, you’ll need a meat grinder and sausage stuffer. No, this is not a post about some remote arm of the Black Sea in the Republic of Georgia. The strait I’m referring to is the Strait of Georgia near Vancouver, BC! 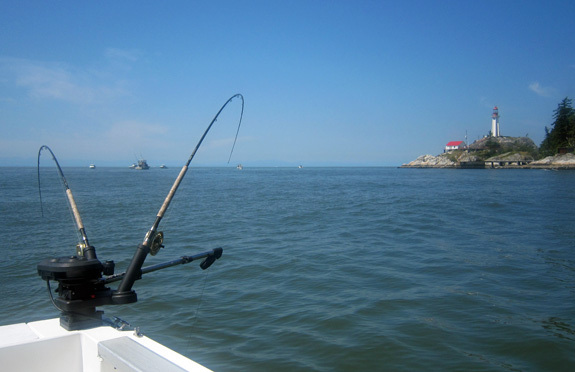 We took a family trip to Hollywood North last month, and I used the opportunity to book my first saltwater fishing trip with Captain Guy at Bonnie Lee Charters. and… strawberries (we’ll leave that one out today). There’s also a simpler, more pragmatic reason for me coming up with this dish: it’s great to catch lots of salmon and trout, but then you have to cook and eat them, and new recipes are always welcome. By the time I was ready to take pictures for this post, though, my stash of land-locked salmon was long gone, and what you see is the more conventional, pinker Atlantic salmon. A few weeks ago, we took another fishing trip with Fisherman John on Cayuga Lake, with the idea of spending one half-day focusing on carp, and another targeting landlocked salmon. The carp turned out to be too elusive for us to catch. We didn’t even see any, partly because of the chaotic weather this year — it was snowing the day before! The salmon fishing was going equally badly for the first 4 hours. I was starting to lose hope, when suddenly we got our first strike. Once the school was found, we promptly caught enough fish to feed our little family for a week, and even released a few, including the 25″ beauty you see on the picture. Landlocked salmon are among the tastiest cold-water game fish one can catch in NY state, and the season lasts from ice-out through spring. 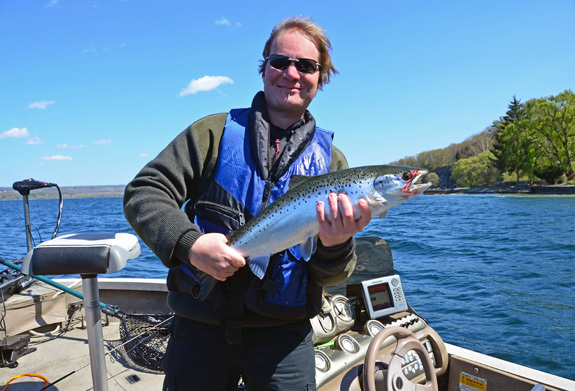 In Cayuga Lake, they’re usually the same species as Atlantic salmon, but with a non-migratory life cycle. The flavor is similar to that of its sea cousins, but milder. The flesh is quite pale and turns almost white when cooked. It came to me that while a burger made with beef requires a ground meat patty so that one can bite into it, a whole salmon fillet is tender enough that it doesn’t need to be ground. 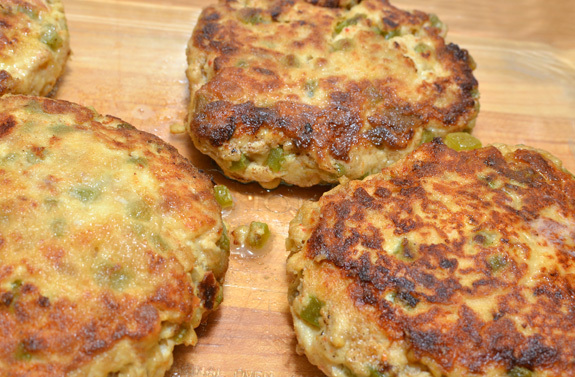 In fact, ground salmon often results in a dry or very fragile fish cake. This is why I’m using small portions of salmon fillet without additional processing. If purists object that it’s not a burger, then they can call it a hot sandwich! 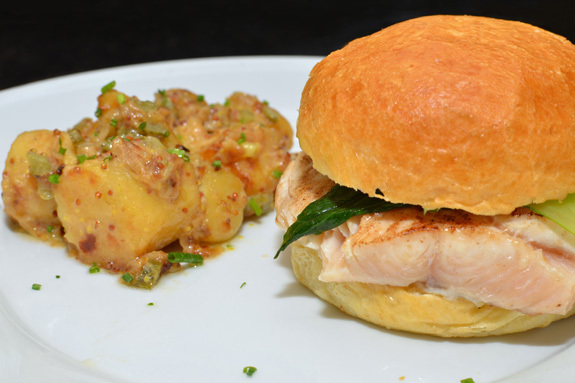 I wanted to make a salmon burger that was easy enough to prepare, and of course with an Eastern European flavor — hence the warm potato salad, for one thing. The way I cook the salmon (on a plate, with butter, at a very low temperature) produces the best result. In my opinion this is even better than sous-vide, as it comes out slightly warmer and less soggy. Place the potatoes in a pot with salted water, bring to a boil, and simmer until fully cooked. Drain, cut into large chunks, and reserve. Melt the butter with a little bit of water in a small saucepan. Add the onions, cover, and cook over low heat for 30-40 minutes, until very soft, stirring regularly. Heat a non-stick pan over high heat. Add the onions and the fat from the saucepan, then mix in the potatoes, and cook until golden brown, stirring constanly. Transfer the potatoes and onions to a bowl, and let cool for 5 minutes. Dry the cornichons with a paper towel, and cut into a brunoise. In a plastic container, combine the crème fraiche, mustard, and cornichons, then mix into the bowl. Serve immediately, with chopped chives sprinkle on top. Season the salmon with the smoked salt and black pepper, then place on a plate with the slices of butter spread on the top and bottom sides. Cover the plate with plastic wrap, and cook in a 200 F oven until medium-rare. Transfer the salmon and any grease from the plate into a blender, add the cream and lemon juice, and process until smooth. Let cool and refrigerate. Place the baby bok choy leaves in a small saucepan with the water and 1/3 of the butter. Add some salt and pepper, cover with a lid, and cook over low heat until soft. Reserve. Season the salmon with salt and pepper, then place on a plate with the remaining slices of butter spread on the top and bottom sides. Cover the plate with plastic wrap, and cook in a 200 F oven until nearly done to your liking (I say nearly, because the fish will be finished in a frying pan). This will take between 10 and 30 minutes, depending on the plate you’re using, the thickness of the fish, and the doneness you want to reach. Heat a non-stick pan over medium heat, add the fat from the plate, and quickly sear the salmon on both sides. Toast the brioche buns. Spread the bottom halves with salmon mousse, and the top halves with cream cheese sprinkled with chives. 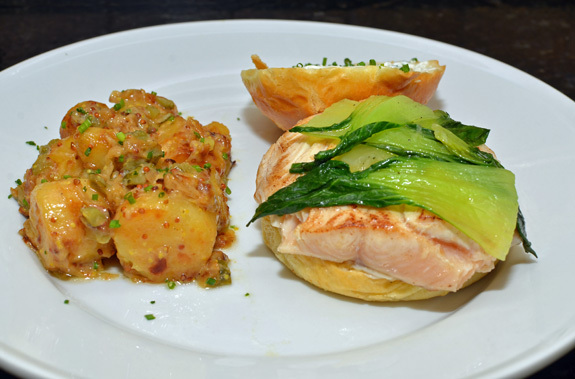 Assemble each burger by stacking the salmon fillet and the drained bok choy leaves. Serve immediately. I’ve been seeing those large monkfish livers at the Union Square Greenmarket for quite a while, but I hadn’t had the chance to fit them into my dinner plans — until recently. Monkfish is found along all the European coasts, from the Barents Sea to the Black Sea. Its rich liver can be prepared pretty much like foie gras, but has a softer texture. It is particularly praised in Japan (as other species from the same family are found all over the world), where Ankino — a steamed liver served with daikon, green onion, and ponzu sauce — is considered a delicacy. I am using an adapted version of Thomas Keller’s recipe from Under Pressure: Cooking Sous Vide. 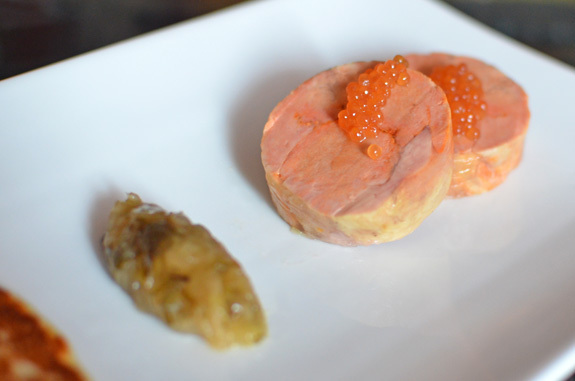 The liver’s mild taste is a great match with trout roe, and the spring onion and garlic jam brings a note of sweetness that extends the analogy with foie gras (which is often served with sweet preparations) while keeping the “Eastern European” part of the Japanese dish (the onion). 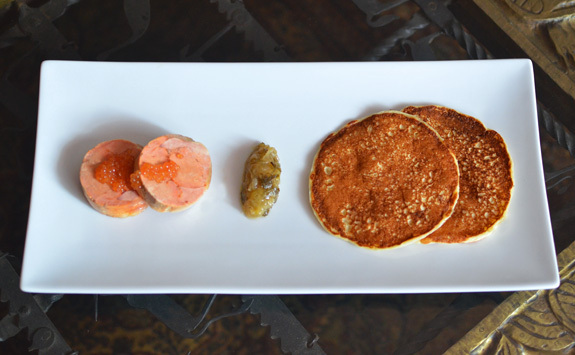 All you have to do is combine the three elements on blini or oladi. Process the sugar, curing salt, and coarse salt with the water in a blender until fully dissolved, then transfer to a bowl. Cut out the large vein that runs through the liver, as well as any discolored areas (but don’t overdo it; the liver should remain in one piece). Transfer to the bowl, cover with plastic wrap, and refrigerate for 4 hours. 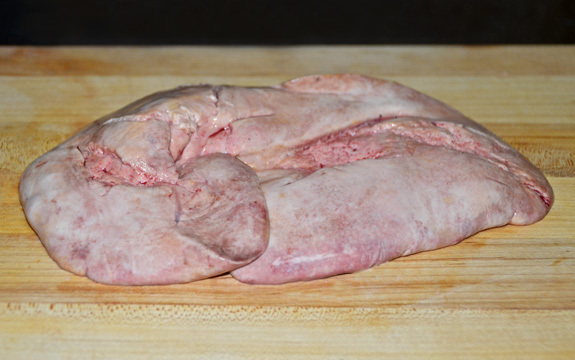 Take the liver out of the brine, rinse under cold water, and pat dry with paper towels. Season with salt and piment d’espelette on both sides, then place on a piece of plastic film smooth side down, and sprinkle the gelatin by sifting it though a strainer. Fold the liver in half crosswise, and cut a slash into the fold. Shape into a log, and roll into the plastic film. Tightly wrap with 2 or 3 more pieces of plastic film, then seal into a sous-vide pouch. Refrigerate for at least 1 hour. Cook in a 147 F water bath for 3 hours and 15 minutes (I must confess I stuck to what Mr Keller’s recipe said for the cooking time… although that last 15 minute stretch seems slightly incongruous when you consider that the exact size and thickness of your liver log may vary). Transfer to an ice bath, and refrigerate in the ice water. 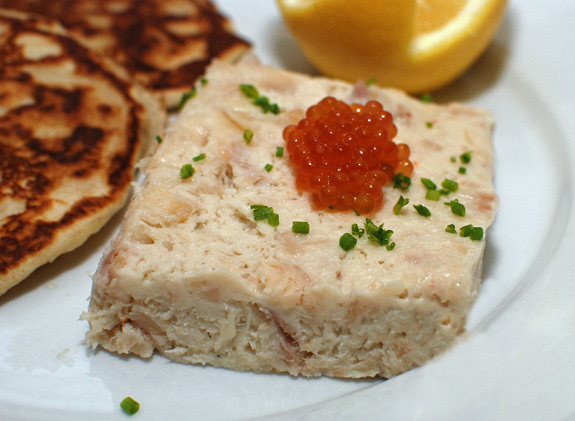 Slice the liver into medallions, and serve with trout roe (or store-bought salmon roe), spring onion and garlic jam, and your favorite blini. 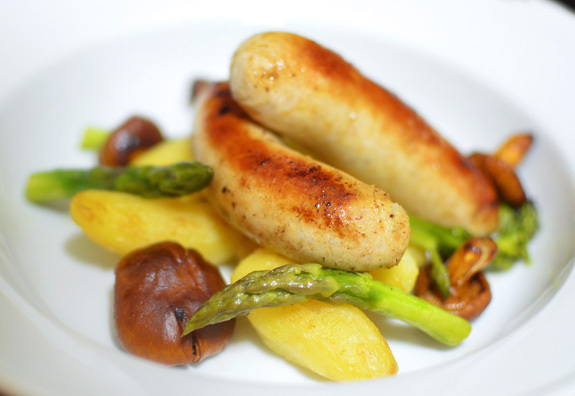 This dish is inspired by a recipe from an article on Georges Blanc in the Spring 2010 issue of Culinaire Saisonnier. This is a fairly simple preparation that emphasizes the flavor of king crab, one of my favorite ingredients. 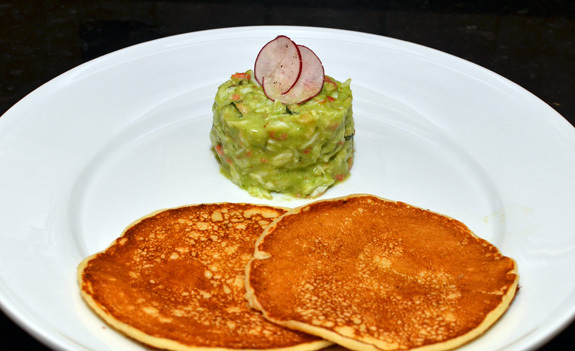 I recommend serving it with pancakes (pick a recipe from this post). Or if you’re in the mood for a more adventurous pairing, try it with a veal carpaccio, or a similarly-shaped veal tartare (maybe an adaptation of my Veal Dubrovnik) . Although live king crabs are pretty expensive and hard to find, pre-cooked, frozen legs are usually of very good quality. Don’t discard the crab cooking liquid that runs when you thaw and shell the legs! It’s very tasty! It can be used in this recipe. Mix the lime juice, mustard, egg yolk, and piment d’espelette in a bowl. Pour the olive and canola oils in a thin stream while constantly whisking. Cover with plastic wrap and refrigerate for at least 1 hour. Cook the bok choy leaves in boiling water until soft, then drain and squeeze out as much water as possible. Heat the crab liquid (or salted water) and gelatin in the microwave until steaming, then transfer to a blender and process with the bok choy. Refrigerate until almost set. In a bowl, mix the crab flesh, mint, and bok choy purée, then fold in the mayonnaise. You’ll notice the whole mixture does not use salt (unless you don’t have crab liquid): usually, cooked king crab is already salted. Fill 4 ring molds of 2 1/2″ diameter with the mixture, place weights on top and refrigerate for at least 2 hours. Thinly slice the radish with a mandoline or a peeler, and toss in a bowl with olive oil, salt and pepper. 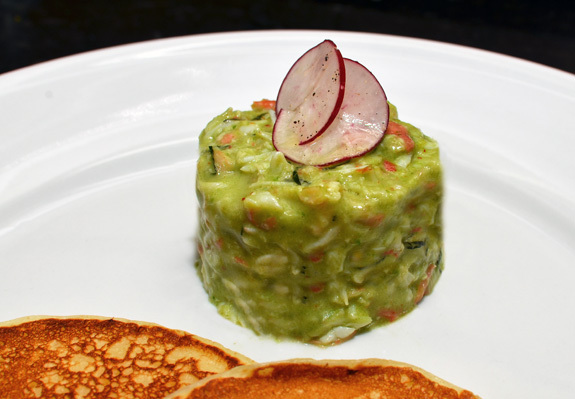 On each plate, unmold one pressed crab cylinder and decorate with a few slices of radish on top. Here’s the second dish in my trilogy of Lake Sevan’s Gifts (the Trout Kutap was my first)! Lyulya kebabs are originally an Azerbaijani dish consisting of a mixture of ground lamb cooked on a skewer. They’re so popular that they spread far beyond the borders of Azerbaijan, and variations are being offered, with other main ingredients such as potato or crawfish. I actually had crawfish lyulya kebabs at a restaurant on Lake Sevan, but the mixture used way too much egg and barely tasted of crawfish. By contrast, my version is almost 100% critters, and their flavor is highlighted by the shallots and piment d’espelette. Make sure you buy crawfish tails that don’t come from China, as they hardly have any taste — not to mention that I don’t see the point of getting from the other end of the world something that lives in almost any river near you! You don’t have to spend your weekend turning rocks in a nearby stream, either — you’ll find plenty of online stores shipping the goods straight from Louisiana. Or if you live in New York, you can go to The Lobster Place. This recipe calls for transglutaminase to bind the mixture, but it’s not absolutely necessary. If you substitute an equal amount of flour, the worst that can happen is that your kebabs will break more easily during cooking. Speaking of cooking: a real lyulya kebab should be grilled on a mangal. As it’s been raining every other day since April around here, I took the liberty of using a cast-iron grill instead. I serve these kebabs with sour cream and plain lavash (top picture) or zhingalov khats (bottom). Some grilled vegetables wouldn’t hurt either! In a small saucepan over medium heat, sauté the shallots in half of the butter until soft, and reserve. Sauté the bread in the other half of the butter until golden brown, and reserve, as well. Coarsely chop the crawfish. Process half of the chopped crawfish with the transglutaminase and olive oil in a blender until smooth. Transfer to a bowl, and stir in the rest of the chopped crawfish. Add the shallots and bread, and season with salt, pepper, piment d’espelette and parsley. Shape the mixture into 4 sausages, about 5 1/2″ x 1 1/4″ x 3/4″ (approximately, this is not a math test!). Roll in plastic wrap, and refrigerate for at least 8 hours. Heat a cast-iron grill over medium-high heat. Brush with a little bit of olive oil, and cook the unwrapped kebabs on both sides until you get a nice cross-hatch pattern. All of the ingredients are already cooked, so you just need to get them hot. Serve immediately. As I’ve explained before, rillettes were originally a spread made of salted pork slowly cooked in fat, but many recipes involving other meats or fish are now common. In a previous post, I showed how to make some simple, quick smoked trout rillettes as an accompaniment to a seared trout fillet. Here is a slightly more complex dish that I prepared with the Cayuga Lake contingent. You can keep the rillettes refrigerated for about 5 days. Serve them cold as an appetizer. 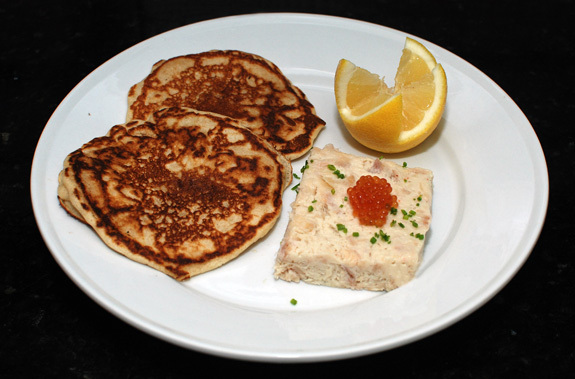 I find that they pair particularly well with trout roe and yeast-free blini, with just a dash of lemon juice and some chives. Spread the olive oil on the trout fillets, place into sous-vide pouches, and cook in a 120 F water bath for 30 minutes. Remove the trout from the pouches, and pat dry with paper towels. Season evenly with the smoked, curing and regular salts and the piment d’espelette, and reserve. Reduce the white wine to 1/4 in a saucepan over medium heat, then add the whisky and let cool. In a blender, process the wine and whisky mixture with 1/4 of the trout until smooth. Place the butter and goat’s milk butter in an electric mixer fit with the paddle attachment, and beat at maximum speed for about 5 minutes. Add the blended trout mixture, and beat until smooth. Flake the rest of the trout between your fingers, add to the mixer, and beat at low speed for a few seconds, until evenly distributed but still chunky. Transfer the rillettes to a 1 1/2 qt terrine mold lined with plastic wrap, cover with more plastic wrap and a lid, and refrigerate for at least 24 hours. Take out of the fridge 30 minutes before serving. Remove the rillettes from the mold and slice. The icing on the cake when you catch your own fish is that you’ll get plenty of fish roe during spawning season — my last trip on Cayuga Lake alone brought almost a pound! Cured trout roe (personally, I don’t like calling it caviar unless it comes from a sturgeon) has become an increasingly expensive delicacy, with stores charging as much as $100 for 4 oz. And yet curing roe is incredibly fast and easy! The whole recipe requires only 3 ingredients, a scale and about 10 minutes of your time. If you don’t have curing salt, you can replace it with regular salt. You’ll be amazed by the result, too. Trout roe is milder and has a much thinner skin than its salmon counterpart, which makes it a good starting point for the fish roe skeptic. The cured roe can be kept refrigerated for a couple weeks or more, depending on the amount of salt you use (feel free to tune it to match your taste). In theory you can even freeze it — something that retail stores do regularly to even out the effects of Caspian caviar import quotas, for example. Place the roe on a cooling rack over a bowl, and rub gently to separate the eggs from the membrane (see picture). Some of the eggs will probably remain attached to the membrane. If you don’t want to throw them away, flip the cooling rack upside down, collect the membrane, and repeat the process; as this second batch is more likely to contain small pieces of membrane, you can collect it into a separate bowl. Rinse the eggs with cold water and strain. Weigh the roe and return to a dry bowl. Weigh 4.5 % of the roe weight in salt, then mix with the curing salt and sprinkle over the roe. Gently mix with a spatula, add the oil and mix again. Transfer to a plastic container and refrigerate for at least 1 day, stirring every 12 hours or so.